In the United States, robocalls are only legal if they fulfill two requirements. Automated prerecorded messages must 1) identify who is initiating the call and 2) provide information on how the initiator can be contacted. Email addresses aren’t the only personal information being sold How Do Spammers Find Your Email Address? How Do Spammers Find Your Email Address? Spam is the closest thing we’ll ever find to an Internet plague. 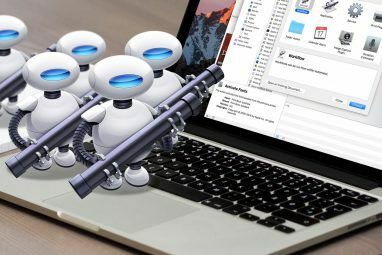 No matter who you are, spam will one day find you and you’ll have no choice but to put up with its pestilence.... Read More ! Furthermore, any private details you share publicly online (e.g. real name, home address, etc.) could be scraped by a private web crawler How Do Search Engines Work? How Do Search Engines Work? To many people, Google IS the internet. It's arguably the most important invention since the Internet itself. And while search engines have changed a lot since, the underlying principles are still the same. Read More , then cross-checked with all kinds of public databases (e.g. census data, property records, deeds and mortgages, etc.) to find your contact information. Honestly, these things are quick to come and bite you in the rear. Even something as innocent as putting your phone number in your email signature could be problematic. Not only can emails can be intercepted, but email viruses are still a real problem 7 Important Email Security Tips You Should Know About 7 Important Email Security Tips You Should Know About Internet security is a topic that we all know to be important, but it often sits way back in the recesses of our minds, fooling ourselves into believing that "it won’t happen to me". Whether... Read More , and they could scrape your emails for details like that. So you’ve made a few mistakes? That’s okay, everyone has. 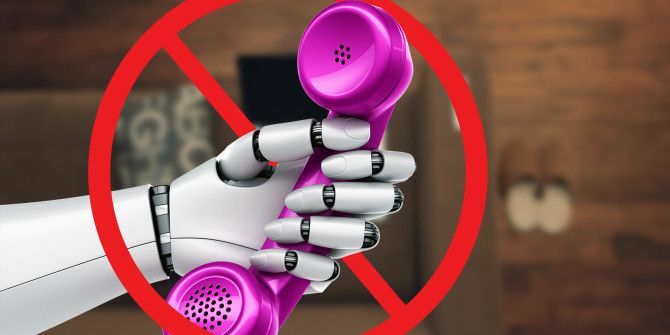 If you’re receiving robocalls, then it’s already too late for you (though you can still put the above into practice to prevent more incoming robocalls), but you aren’t completely out of luck yet. Hang up right away. Some people claim that you can input a special number sequence to prevent robocallers from calling again, but that doesn’t really work these days. Others say that you should wait until the end of the call for directions to unsubscribe, but don’t do that either. Talking or pressing buttons affirms to the robocaller that your number is a real working number, and they will flag it as such, which causes more calls to come your way. On the other hand, robocallers will tend to pass over numbers that are disconnected or never pick up. Sign up to the Do Not Call list. The United States has a National Do Not Call Registry that’s easy to enroll in. Legally, telemarketers aren’t supposed to contact you if you’re on the list, but while most telemarketers respect the Do Not Call list, some don’t. It’s not completely effective. For those outside the United States, your country may have its own version. For example, the U.K. has the Telephone Preference Service, Canada has the National Do Not Call List, and Australia has the Do Not Call Register. Revoke calling permission. If you unknowingly gave consent to a business to robocall you, you can always take it back. Call customer support and ask to be put onto the company’s own do-not-call list. Also, keep a record of when you made the request. Wait at least a month, and if they don’t stop harassing you with unwanted calls, report them to the Federal Trade Commission (FTC). Block individual numbers. If you’re being hounded by the same few numbers, consider blocking them. 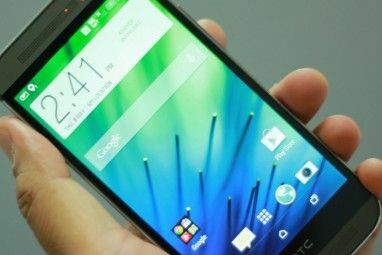 Most Android and iOS phones can do this without third-party apps, but if not, apps do exist for this purpose. Some apps can even identify incoming calls as spam. Another option is to make a Google Voice account 5 Cool Things You Can Do With Google Voice 5 Cool Things You Can Do With Google Voice Read More , forward calls to your actual number, and start using the Google Voice number as your main number. Google Voice allows you to block specific numbers. Always read the fine print. It’s a pain in the neck, I know, but whenever you’re presented with Terms of Service and you’re asked for your phone number, check the fine print. Next time, use a fake phone number. If you really need to sign up for something and a phone number is required, consider using a fake one. Obvious this depends on the situation. Getting a store credit card? Sure, use a fake. Paperwork for the dentist? No, use your real number. In 2014, the FTC was receiving over 150,000 robocall-related complaints every month, so you can rest assured knowing that you aren’t alone in this. The unfortunate truth, however, is that robocalls have been and will continue to be a problem for years to come. The above tips should help lessen the annoyances. Be careful about publicly exposing your phone number, sign up for the Do Not Call list, don’t interact with robocalls, and block any numbers that pester you. Other than that, there’s little to be done except complain to the FTC. You may want to start using a free phone number for calls and texts The 5 Best Free Calling Apps for Making Free Phone Calls The 5 Best Free Calling Apps for Making Free Phone Calls Free calling apps provide free phone calls and texting. Here are some great options for Android and iPhone. Read More when you’re asked for a phone number, and reserve your actual phone number for friends and family only. Do Not Call Registry is useless, this is another area where the Government has been very ineffective in taking care of the needs of citizens. And the scammers will use a different number every time to call. TRUE, TRUE, and more truth. We got ooma about 3 months ago and we absolutely LOVE it. Our phone has been so quiet. I would happily pay a hundred bucks a month. I have had 15 calls today from the same company a federal student loan forgiveness something if I answer them and try to ask them to quit calling they immediately hang up on me I’ve tried blocking the calls it doesn’t work I have block so many numbers immediately goes to a different number the calls come from all over the United States often their local numbers but it’s always the same company they are driving me crazy!!! I am fed up with these robo calls, I'm getting around 10 calls and voicemails a day, some call more than once a day :( The Donotcall list is useless, doesn't work anymore ... I did some research online and found something called nomorobo.com and it definitely helps. You have to sign up, it's totally free but you have to see if your phone carrier accepts it- Verizon does. You put in your phone number and once it's activated, you will still get a robo call but your phone only rings once and nomorobo deflects it and they can't leave a message! I signed up, it totally works and at least I'm not getting all those annoying messages. At least that's something! Check it out. Thanks I’m going to check into it right away ! So l've been getting calls from the same robotic number. Within the pass to weeks the calls have increased. I now receive 20 to 30 calls per day! They all start with (313) 251. No one speaks and lt goes to v.m. lt takes up my V.M. box to the point l have to clear it everyday. I have a blocker on my phone, but the number are all different with the last 4 digits different. So they all get through. Dont know what to do from here. I get a call every 7-10 minute. Pissed.
" ...but while most telemarketers respect the Do Not Call list..." What planet do you people live on? Criminals do not have any respect for any laws, that's why they are criminals! "Automated prerecorded messages must 1) identify who is initiating the call and 2) provide information on how the initiator can be contacted." I couldn't stop laughing! If they give you any information it will be a lie. If they give you any telephone number, toll-free or not, it will be a wait-and-nothing-happens or it will be busy FOREVER. Telemarketers are in the screw-you business and they will tell you 1000's of lies just to get your credit card number. I get 60-70 Robocalls per month or 2-3 per/day. They all come from a place called US Pharmacy. Or Canadian pharmacy. They are VoIT robocalls. Being handicap it's hard to get to the phone sometimes. I've asked them a hundred times to stop calling and harassing me. They are rude nasty Indians chinese or possibly Pakastani..some will tell you to go Fu?? yourself when you ask them to leave you alone. I use the robo calls to practice my acting skills. Previously I had hung up, punched the number to be on do not call, used google voice to block the caller number. But the most effective way is that if they use my time I will use up theirs. I aways respond to the robot. Sometimes grunting to see what it will respond. Then I go to a live person, always excited to take advantage of their promotion. Once I get to the actual salesman the name of the game is how long can I keep them on the phone before they hang up on me. I respond with the same type of responses that the machine gave me. I ask them to repeat their pitch several times. I say um I didn't understand. When they finally ask for a credit card ask for a moment. Then I come back and say my mommy wont give me any money. I have created background arguments that they hear and it is a wild as the imagination. Ask for a date. Tell them I invented post its. Etc. So use them to have fun and the stress goes away. FTC?/ OUR GOVT ?? DO NOT CALL LIST?? FORGET IT.. All of these people are a bunch of LAZY ASSES that dont want to do their jobs.. Think about it. Yrs ago, it was almost unheard of to get 1 / 2 calls a day from telemarketers.. Yesterday i got 12 alone. Yes i said " stop calling me? they hang up. If out govt WANTED to stop those calls, they surely could, BUT WONT,, ONE WAY??? Stop GIVING THOSE IDIOTS UNLISTED NUMBERS..!! They call m,, i call back recording says " no such number,, OR operator says" number out of service,, OR that number isnt accepting calls at this time.. Funny, they just called me,...Make them have number where we can call THEM back. Think about it, if WE could call THEM back they would STOP bothering us, WE could bombard them with calls day/ night. So, why does our govt [ FTC] not stop them? Why do they give then unlisted numbers or numbers that we cant call them back on?? Do this sound like out damn govt OR FTC CARES??????????????????? And yes, my numbers have been on the DO NOT CALL LIST FOR YRS. I cant register those numbers anymore. I totally agree. If I didn't give you my telephone number then don't call me. Simple as that. I don't want these people calling me period. Where are my rights? The government needs to do something about this. How many people are on the 'do not call registry'? What's the sense of doing it or having it? It is useless. I don't know anyone that likes these calls. Come on! The government is supposed to do what's best for the people. Not annoy them and let these people to call. They interrupt my sleep and yes, a lot of them are scams. I would like to turn off my ringer but my parents are elderly and I don't want to miss a phone call in case of an emergency. The article mentions that often folks DO give their number out. They just don't know where their number will end up. Usually folks give out their number in the hopes of "winning" some prize or they actually DO win a year's supply of paperclips or something equally as cheap and had to fill out a contest form that included contact information. You asked where your rights were, you gave them away in exchange for greed. The govt doesn't care if individuals get scammed by private businesses whether they be US or global businesses. If they cared they would have stricter regulations. But the US govt can't restrict capitalism which some would argue it is trying to do with regulations. I get at least 2 or 3 recorded message calls a day. I've received calls that say they are from my own number. I block the number each time and they constantly change number so it's impossible to stop them. our company phone is with Century Link. We receive 6-10 robo calls every day and they only connect for 1-3 seconds. We have been unable to trace the call. It seems the computer autodials our number 5-25 times in a row before it stops. This is very disruptive to our business. it has been going for over a month now. We tried the Do not call list and are waiting the 30 days to see if it helps. Century Link says there is nothing they can do. Please help stop this practice. The 3-in-1 Home Security Systems (aka United Security) keeps calling me day and night with one of the following caller IDs over the past month. I keep getting these phone calls too from some home secruity company!!! Here's some more numbers for people to block. The relentless telemarketer's calls really upset me. The Do Not Call blocking does not work. Government does not seem to have better way to help us either. They just keep calling and calling, multiple times a day, sometimes waking me up at night. The recent really annoying one comes from "Free 3-in-1 Wireless Security System", using various Caller IDs, including (715) 304-0676, (682) 205-2766, (570) 867-8743, (904) 245-1611, (612) 314-9242, etc, calling me day and nights. My cell phone, with earlier version of Android and can't be upgraded, does not support number blocking functionality. And that's company's phone, for on-call production support, must be turned on 24 hours a day. As a counter measure, I install Asterisk in my home Raspberry Pi, and set up a SIP trunking with a SIP service provider. That uses my money but it's not too much and I don't care to spend that. Using shell script, I randomly setup an outgoing caller ID for each call, and schedule a cron job to run every few minutes to automatically call one of any of my received telemarketing numbers. Once the call is pickup, wait 10 seconds and hang up. That is, I am using robot calls to defeat robot or human calls. Please thank me if you receive fewer spam calls lately. And if you can do something similar as above, that will be even better. Together, we will defeat the harassment calls! Apparently they are now starting to add office noise to the software. I mentioned not liking a robot call me, and I immediately heard a bunch of typing, ringing phones, and background mumbles while the voice said "I am a real person, just talking through a computer". Haha, wow. That's actually kinda clever. Had no idea that was a thing... Thanks for the info, Paul! Yeah, I've noticed the same thing happening. Check out telezapper2020.com that I just heard about. It appears to be an advanced calling feature that enables all cellular, VoIP (internet), and landline carriers to easily block virtually ALL unwanted computer-generated, telemarketing, Robo and tele-criminal calls for their subscribers. It works within the providers call processing mainframe network to prevent virtually all telemarketing and Robo calls from being completed to the subscriber. It seems to be designed so that in most cases your phone will never even ring. Robo callers just get Zapped. I’m calling my carrier today to see if they offer it yet and will switch phone service if this works and my carrier doesn’t offer it. I know this is a brand new so if someone finds a carrier who already offers this service, please post if for all to see. I need to get it for my cell and landline ASAP! Yes, in the UK we have the Telephone Preference Service - and it's as much use as a sick headache, frankly. Not only does it only block callers of this type from within the UK (or maybe EU?) whereas a vast number actually come from the US and other places outside that remit, but it doesn't seem to block all calls from inland either. I don't know if this is to do with the companies concerned being registered outside the UK, but whatever the case it's simply a waste of time registering - and that goes for fax numbers etc. as well. As I work from home this robocalling grew into a huge problem. I was, quite literally, being called day and night both through the telephone and the fax machine, and was being woken up every night. I tried various solutions (starting with the wretched TPS), and then finally stumped up the upfront amount for a trueCall (and no, I'm not affiliated with them). Perfect solution. Yes, it's expensive at the outset but after that it's either free or you just pay a nominal amount for the online dashboard (£15 a year, I think, and you don't have to have it because you can do everything through the handset of your telephone). It not only blocks calls but you can customise things like blocking all calls, or all calls except for particular numbers, during some hours of the day or night, or you can block all international calls by default - all sorts of options. It's not worth wasting time on elaborate workrounds or protections which have to be upkept or renewed - investing in a trueCall is a one-time thing and it works perfectly. Oh - and you can analyse your logs if you have the dashboard, and I get around 150 robocalls a month! I get calls daily. The biggest problem isn't legit robo callers. It's the scams that spoof their phone number so that it appears to be a local number. I even got a call from one "reduce your credit card interest rate" scam that showed MY cell phone number in the caller ID. IMO, spoofing phone numbers just enables robo calling scammers. If the calls are to your landline, I would strongly register with NoMoRobo. No, I am in no way affiliated with them. I amjust a satisfied user of their service. This article stops short of tapping into the greater potential of using Google Voice to reduce unwanted calls. I started getting a lot of telemarketing calls after I registered a domain name without making my registration info private. Mistake. Once I realized what happened, I changed the phone number on my registration details to my Google Voice number. Google Voice filters out spam calls automatically, so now I almost never get telemarketers trying to reach me these days. I would suggest that people use a Google Voice number when signing up for services that they think might give out their number. A few telemarketers still call, so when they do, I add them to a "Telemarketer" contact entry that I created on my phone (I tend to get telemarketers calling from the same numbers). I set the ringtone for Telemarketers to silent, so now if one calls I will never hear it and it won't disrupt my day. You can sign up for the Do Not Call list. However, I think you have to re-register every 5 years. To stop robocalls to my landline, I registered with NoMoRobo.com It's a free registration. They have a database of phone numbers from which robocalls are made. Once you register with NoMoRobo, you can add numbers that you want blocked. Using that feature of the service, I have drastically cut down on political calls. After you have registered with NoMoRobo, do not pick up the phone as soon as it starts ringing. You have give the service a chance to intercept the phone call and match its originating number against the database. If the number is in the database, NoMoRobo service severs the connection after one ring. If your phone rings more than once then you can be reasonably sure that it is not a robocall. Since robocalls are being made from new numbers, it is possible that one might get through every once in a while. If it does, just go to the NoMoRobo site and add the new number to their database and you will not be bothered by that caller again.
" I’ve heard that NoMoRobo is spotty"
In close to two years year of use, I am very satisfied. Just like with malware, you cannot stop 100% of occurences. As I said, since miscreants constantly use new numbers, occasionally a robocall will get through. If it happens more than once and you have caller ID, just sign on to the NoMoRobo site and add the number to their database. The only calls that I can do nothing about are the ones that say "Number Unavailable" or "Number Blocked." Happily there aren't to many of them. I registered with the National Do Not Call list shortly after it became active. It was a joke. I was still getting inundated with calls from the number that were exempt, politicians, charities, etc. Then I registered with NoMoRobo and started adding unwanted numbers to their database. Now, all I hear is one ring and that's it. I also use my answering machine to screen calls. If I do not recognize the number, I let the machine pick up the phone. If somebody wants me badly enough, they'll leave a message. 99.9% of the time there will be no message. Do not want to get phone calls from your mother in law - what a sexist cliche. How about pervy, ugly men?